So you’ve bought a new home. Or found a new apartment. Perhaps you are moving into your own home for the very first time. Or, you are establishing a home together with your new husband, wife, partner or significant other. Traditionally, a Jewish home is not complete without a mezuzah on its doorpost. You may have noticed that a mezuzah is often hanging neither vertically or horizontally, but rather is tilted at an angle. The origin of this custom can teach us about an important Jewish value: Shalom bayit, peace in the home. The custom to hang the mezuzah at an angle began as the result of an almost one thousand year old disagreement. The great Torah scholar Rashi (1040-1105) ruled that the mezuzah should be hung vertically. He did this because in a Sephardic community, such as the one in which he lived, the Torah is held in a vertical position when it is read. On the other hand, Rashi’s grandsons lived in an Ashkenazic milieu. Because the Torah is laid in a horizontal position for reading in Ashkenazic communities, these grandsons ruled that the mezuzah should be hung horizontally. 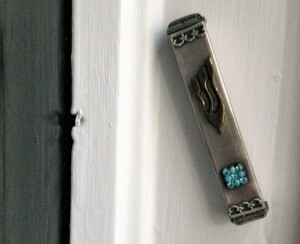 In the spirit of compromise, the custom became to hang the mezuzah at an angle. Put another way, at the very moment when we enter our homes, we are reminded of the importance of finding a way to live in peace with one another. The point isn’t that we’ll always see eye to eye with the folks we live with; rather, it’s that we commit to working through our disagreements with one another. The very first word on the mezuzah scroll is “Shema,” or listen. We make a commitment to listen to each other and to find a way to live in peace with each other. Shalom bayit, like so many of our values, is not to be attained all at once. Rather, we make a commitment to work with our loved ones towards this goal each day, with its blessings, each day, with its challenges. Each day, when we return to our homes, we see our mezuzah, our reminder of peace and compromise, our reminder of the type of home we would like to create, before ever we cross our threshold.